This great introduction to alpine rock climbing ascends long stretches of 3rd and 4th class occasionally interrupted with an exposed 5.6 move. Even the 3rd class sections are interesting and fun. You choose the exposure and climbing difficulty by either staying directly on the ridge (harder) or moving to either side of the ridge (easier). Following the climbing route is straightforward but the approach and descent are more devious and require skill using a USGS map. Located at a relatively low elevation, this climb is usually warm enough to climb up until the first snow of the year (usually in November). 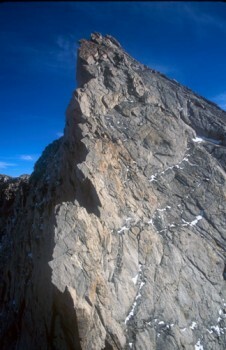 Compared with Cathedral Peak, the North Ridge has less technical climbing but much more hiking, routefinding, and elevation gain. One of Tuolumne's finest ridge climbs.